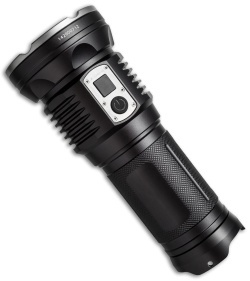 The JETBeam DDR30 flashlight is the world's first high lumen LED flashlight with a digital display. This patented display allows you to moniter power levels and switch between modes with ease. The batteries can be charged internally with an included car charger or an optional wall outlet. The high performance optical system enables a max beam distance up to 450 meters and 3300 max lumens. Includes a wrist lanyard for comfortable use. Digital display for monitoring modes and power level. 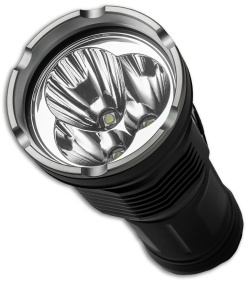 Made from durable aircraft-grade aluminum. 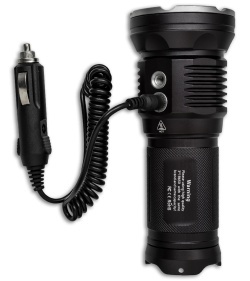 3 illumination modes and a strobe light mode. Rechargeable with included car charger or optional wall adapter. Easy operation with side mounted push button.